The item pictured to the left is a portable oxygen tank. It is my friend. It is my constant companion now when I am out. It is the bane of my existence and the reason for same. It is no different than millions of others that are needed by millions of people. It may not always look like this. It may be a brace, a wheelchair, a replacement limb, or hundreds of other assist devices. But this is mine, and it is personal, and it carries my expectations. Expectations are a funny thing. They can be realistic, yet what defines realistic? Is being “realistic” simply staying within safe parameters? Does having unrealistic expectations mean that they cannot be achieved, or that you simply are afraid to try. When I joined Twitter(and Facebook), I had varying expectations. I wanted Twitter to allow me to connect with others who might find me interesting enough to think to hire me. I wanted to keep in some sort of contact with my past acquaintances and industry , to try to find a way back into my home for 27 years. I wanted to experience others and to possibly learn. However, my expectations at the beginning kept me guarded as to who I really was and overly worried about how who I was would be perceived. Those who knew me recognized me, but those who didn’t were approached cautiously. Essentially I tried to become visible, yet remain anonymous. I expected the same from others. My expectations were sorely misjudged. I have found that those who I meet on Twitter and Facebook have been some of the most supportive, fun, and caring people yet. Yet, while I have my expectations, they have theirs, and sometimes, they collide. I follow a lot of sports bloggers, and my expectations of them were of a fun brotherhood with a shared passion. Instead, I found great writers who sometimes seem to expect to be seen as the “go-to” source. I’ve also seen this degenerate into mean spiritedness and denigration of blogger by blogger, blogger by sportswriter, sportswriter by blogger, et al. My expectations for one big happy family of sports lovers had to be modified into individual expectations of each writer. The same goes for my expectations of the rest of my friends on there, and wonderfully, I can say that I’ve developed a very entertaining and comfortable set of friends on there. Some have become very close to me over the last year. Back to my oxygen tank. I expect we will be inseparable for a long time, at least while outside. I have no idea what to expect about my condition going forward. I choose to set my expectations so that I will always strive to maximize my limits and that I will remain useful and vibrant, even without being able to do work like I used to. However, I expect to always secretly hate the oxygen tank, if only because it always talks first. Just like a silly hat, people notice it before almost anything else. That means my past method of introducing myself, with a handshake or a “Hello, how are you?” has been compromised by this thing in my nose and on my shoulder. Even walking in public, it will draw glances, which I do not want. No, a child will not think I am an astronaut. They will ask mommy or daddy in a whisper what this is. It is unavoidable, and I don’t expect to ever shake that feeling. However, my expectations in public, past that initial stare, is that you see me as you see anyone. Except for a true physical barrier, don’t treat me any different. Treat me as a friend, a customer, a neighbor, a seat mate, a person. Yes, my life is vastly different now. Money is extremely tight, living costs means that I move into my sisters house, and some dreams and expectations of what I could have accomplished and where I could have traveled in the next ten years and beyond have to be greatly altered. However, my expectation is that I will live that life to the fullest, surrounded my great friends , like many of you. And my family. My final expectation is that on Wednesday, when I finally turn in the key to the apartment, and say good bye to over 7 years of memories with my Dad there, I will break down and bawl. I expect to finally feel the emptiness of the situation, the unavoidable nature that it has to end. I will be a wreck. However, my expectations are that life will go on, that I will eventually be comfortable in my new home, and that friends now will remain friends forever. And that what I shared with my Dad with be present in every one of you that I know. 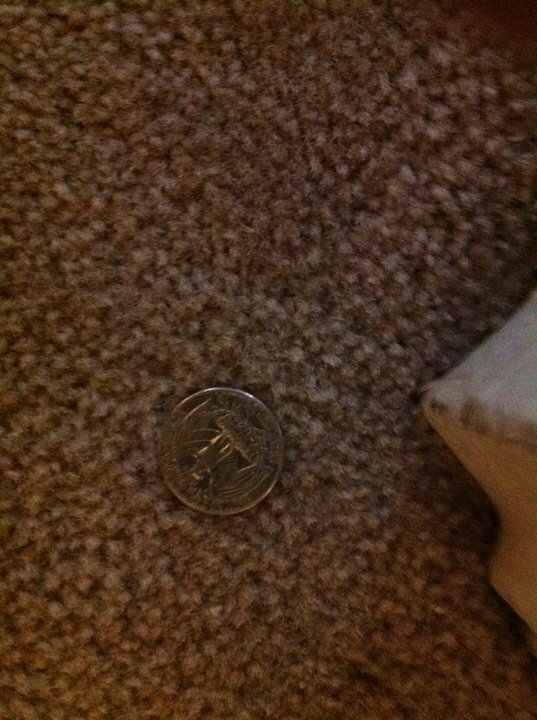 That quarter pictured after this post is the last thing my Dad really worried about. He dropped it as he stumbled backwards and hit his head on Nov. 30, 2010. Even as the bump on his head grew, he attempted to reach down to pick it up. At that moment, that quarter meant the future to him. It has remained right there since then. It will be the last item I take from the apartment. I expect that it will always be with me, and that Dad will always make it more valuable than gold to me. I was off work that day, in the bedroom getting dressed. I turned the TV on and saw that Peter Jennings was on air. The video was a very grainy shot of a plane hitting the first tower. I will confess that I thought I was seeing a news feature about a “what if this happened” moment. It looked Hollywood, unreal, unimaginable. It took a few minutes to realize that something really horrible had happened, but still, it did not sink in. Moving downstairs, I turned on the TV and watched as the picture became clearer, if not what was actually happening. On the TV, I saw the second plane hit. This was much clearer. I saw some people jumping, not for their lives,but to choose the way they would leave this earth. I saw the South Tower start to crumble, and just a minute before it happened, there was no doubt that it was going to fall. It was inconceivable what was happening, yet it was happening. Still a mass of confusion, I left to pick up my nephew and niece from their schools. The confusion there was the same mix of sadness, tears, and wondering. I checked with my video store at 4th And South, knowing that they did not deserve to be alone at this time. Since it was so close to Independence Hall, the rumors were flying of a plane heading towards there. I checked with the main office, and was surprised that most of them had gone home without notifying the stores about how to proceed. We were on our own amid the confusion, just as millions of our neighbors were. I called the then General Manager and screamed at her (she is no longer there). I could not believe, on this exceptionally frightening day, that the stores were seemingly abandoned with the wild fears that were running rampant. Almost every other business closed that day. At the store level, we decided that we could help in another way, a way to help be there for comfort and escape. In retrospect, my staff that day was also valuable, because while they were scared, they chose to stay there, and by doing so, became a place for the neighbors and customers to escape from the horror for a while, if not to get a DVD, then at least to have someone to talk with and cry to. I truly appreciated my staff that day. You know how the rest unfolds. The terrorists weren’t after landmarks of patriotism, they were after the nerve centers of business, defense, and executive powers of the US. They wanted to cripple these things, not just piss us off. We finally killed Bin Laden in 2010. We continue to fight wars that claim the lives of many of our bravest and seem to have no end and , at times, no continuing purpose. We still live in fear, both real and manufactured, or both dangers from without and dangers from within. And some have used 9/11 as political hellfire, to tarnish entire cultures without regard to what out country truly stands for. However, we became one nation that day and remained that way for a while. No matter what political party, religion, state, or race, we all became one for a while. While it dealt a terrible toll on life, it did not accomplish what they truly wanted. We are still a nation and always will be. We stand for each other and we stand for America. We stand for humanity. The rest is not history, it will forever be a part of us. The lasting memory that I have is of a young man, jumping from the WTC, his tie fluttering in the wind, his dress shoes still on, and the thought that he chose the way he would leave. It was not an act of fear, it was an act of independence, and that is what the terrorists could not take from us. 9/11 is a time of remembrance, a time of reflection, a time of rebuilding, a time of renewed determination and confidence, a time of all of us. 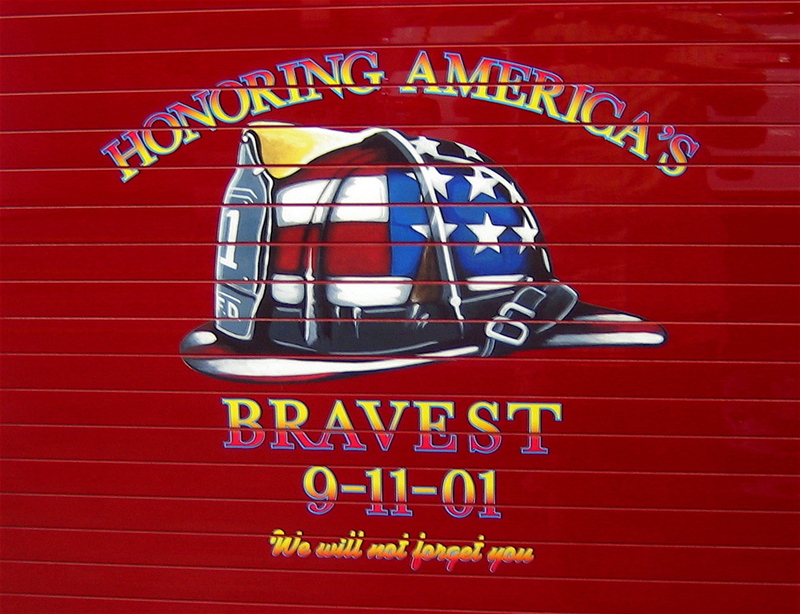 God bless all on 9/11.